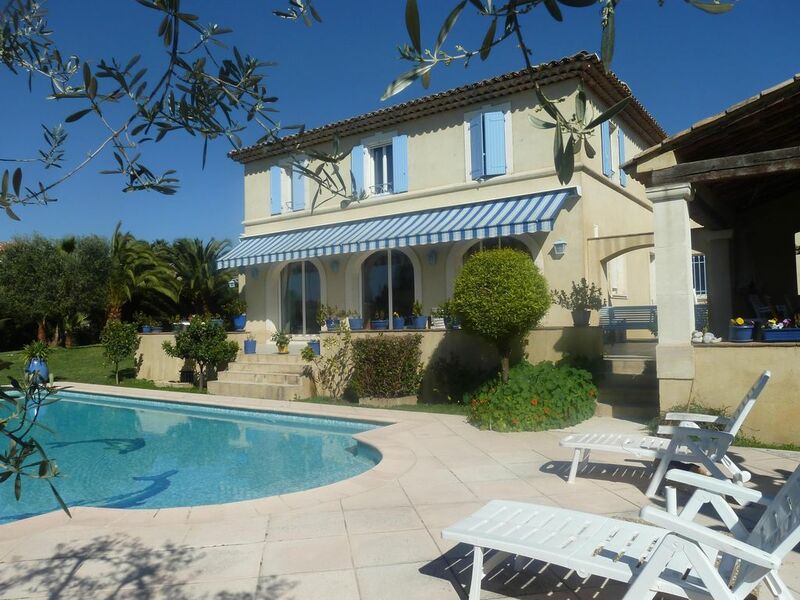 Very nice recent Provencal farmhouse in tranquil residential area ideal for holidays with climatisation . Unimpeded view of sea, mountains, countryside. The farmhouse is on a 1700 m² grounds with Mediterranean plants (orange, lemon, mandarin and cherry trees) and palm trees, mimosa and olive trees. Lots of green plants and flowers. Large pool and 25 m² outside kitchen with barbecue for eating to the sound of cicadas. The 230m² farmhouse comprises a fully functional kitchen with all modern appliances. The 65m² south facing living room has access to the terrace and is air-conditioned. There are 4 bedrooms, 3 bathrooms and a garage in the cellar. All shutters are electrically opened and closed. The large 40 m² terrace is shaded by an electric blind. Very easy accès for everybody Also for older people.Numerous authentic little villages to visit in the surrounding area. Just a few kilometres from Nice, Monaco, Cannes and Italy. .
No more 2 childrens in each rental period . The villa is at 15 minutes by walk from the center you can find shops for souvenirs restaurants movies supermarkets.The old town is very interesting with a famous church with painting of Chagall. You can find all activities.